Begin with an 11 pound boar shoulder with the roasting ham intact and 4 and a half pounds of either fat back or bacon belly. Carve away anything that is bone or silver skin or hard tendon, but render everything else into 1-1.5 inch cubes. You want to end up with roughly twice as much lean as fat so that your final grind is basically 1/3 fat. For us, the 14.5 pounds we started with rendered about 10.5 pounds of lean and fat. Pass a relatively even 2/1 distribution of lean to fat cubes (so that you don’t have to over-mix later to fully integrate) into a meat grinder with a fairly coarse screen choice. Spread on a hotel sheet into as thin and flat a layer as you can without over working it so that it all fits on the pan. Sprinkle approximately one gram of kosher salt for every 60-80grams of meat (and fat) depending on your personal seasoning preferences. The charcuterie book I was referencing actually said 1 per 45 grams, I cut that back to 67 and then didn’t even put all that salt on because it looked like way too much and the end result was plenty seasoned for my tastes. Put yellow mustard seeds and black pepper corns in a spice mill and render fine. Blanket the meat with this powder. When I say blanket, I mean don’t hold back. Make it hard to see the meat. Apply a sparing amount of smoked hot paprika (or a mixture of smoked and hot if you can’t find smoked hot) depending on your taste — remember the result is a sweet Italian, not a hot Italian and not a kielbasa. Blanket with fennel pollen. If you can’t find this, grind fennel seeds to powder. The result will be a bit more licorice, and not as sweet, but it still works. Fold the meat in on itself to the center, gently. Repeat this only as often as you feel necessary to integrate the spices. Pull out a small ball and pan fry it in a skillet until cooked through to check seasoning and spices. I recommend portioning into one pound amounts in freezer bags with labels and dates. If you have access to natural casings and equipment and a lot of patience, knock yourself out. I don’t, so I keep it loose. I also recommend taking at least one pound back to the nice person you bought your wild boar carcasses from. In Texas, wild boar are treated like a type of infesting vermin on cattle ranches. Eating their meat is encouraging neither their domestication nor them being hunted wild. It is a way of ensuring that an animal which will be shot one way or another, doesn’t go to waste. If where you live doesn’t have a wild boar problem, consider finding an ethical source of pork. You will struggle to get beef, lamb or poultry sufficiently fatty for this to produce a sausage which doesn’t seize up and become bone dry when cooked. A few more successes with basic pan sausages and we’ll be moving on to cured salumi. I have a new obsession. Braised duck tacos. The problem with the potion that makes these delicious items possible is that it requires the sacrificing of a duck. No, I don’t mean the one you’re going to eat as tacos. I mean one you probably won’t eat at all, because it may not be very good once cooked. This truly is a recursive potion, and the zero-th iteration is a boot strap and so the results aren’t anywhere near as satisfying as the one through n-th iterations. The best recommendation I can give you is to get this zero-th duck in the Summer, when they aren’t really up to full weight yet, as such a duck won’t yield much meat anyway, but will produce stock, as it will be very bony. You won’t get much, if any, schmaltz from it, but that’ ok, too. Make sure you have a Dutch oven that is big enough to hold up to about a five pound duck. For the zero-th duck, fit it into the Dutch oven, breast side down, with the skin scored throughout to allow what fat there is to weep out of the skin. Fill with water until the bird is mostly covered. Cover. Put into an oven set to 210 degrees for at least six hours, until the carcass more or less completely collapses because all the gelatin has melted out of the bones. Clean what meat you can, strain stock and separate what fat there is. Store the schmaltz separately, but you can store the pulled meat in the stock as if you were making a confit — not that it will last that long. For every duck after this first one, and now I’d wait until you can get at least a five pounder which is likely to be well into Autumn, score the skin, put in the Dutch oven the same way, but instead of covering with water, cover with the stock and schmaltz from the previous duck. Add some water to make up for whatever stock you’ve used in the meantime for other purposes. Again, pull the meat, strain the stock and separate the schmaltz. Duck cooked in duck is… well it’s fantastic. Thin slice a jalapeno or similar pepper and sauté in a small amount of schmaltz. Before it begins to brown, add pulled duck meat and salt. Add just enough stock to keep it from burning and to make a small amount of sauce. Fold into a soft flour tortilla, lay flat in a hot skillet, place a lid to press the semi-circle flat and toast the tortilla on both sides. Top with a mild cheese if you really want to. You will never think about tacos the same way again. Saute kale in schmaltz with salt and roasted garlic. Improve any sauce, gravy or soup with the stock. Use the schmaltz in place of butter in just about anything. When you start to grow concerned about your supply, recurse another duck. Because you’re recursing the cooking process, if you cook with salt, the results will just get saltier and saltier and saltier. So braise without it, and then season what you’re using in other applications as you go. Hello again! This cook blogger (clogger? coogger? No…) still exists! This is short, sweet, and to the point. I have finally found a way to cook pork chops that do not disappoint me. Previously, I managed very dry chops. Dry chops are great if you are trying to make a saddle, shoes, or want to show someone how much to dislike them joining you for dinner. Moist, savory chops are how you tell your mouth that you love your taste buds. My chops have been about 1″ – 1-1/2″ thick. Obviously, this needs to be altered for thinner chops. Enjoy very moist, savory chops. * See, there’s that rosemary thing. 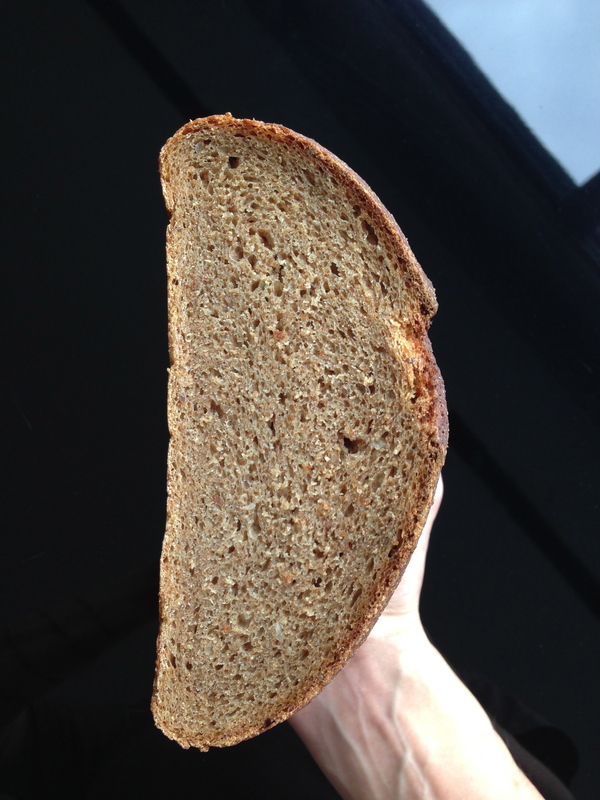 The bread recipe I keep carrying on about has other variations that I haven’t fulled explored. Recently I attempted rolls and felt like I had a whole new Class Trait that I’d never explored. Of course, learning more that baking is scientific, I carefully measured things out to yield 24 rolls. The original recipe calls for about 12 rolls from the entire dough but I decided that those Troll-sized rolls might be a bit too much to go with a meal. My current pattern is to take half of the dough and make a loaf of bread, and then use the other half to make 12 rolls in an 8×13 pan. The pan helps the rolls keep a taller profile; I tried half of the original batch on a cookie sheet and they rolls were more the shape of mushroom caps. The rolls are simple (following my 1 loaf, 12 rolls method here): divide half of the dough into 4 equal parts. Using a scale here helps. Then divide each of those lumps into 3 equal parts; using an even smaller scale here helps. This may sound a bit retentive, but it helps the rolls to bake evenly. Bake for 25 minutes at 350F. Let cool until safe to handle, and I usually remove them from the pan with a plastic spatula (won’t scrape the pan) and then cool on a cookie rack. These can be frozen just fine. Baking is science, not improv. Wheat recipe: nice light rolls. Spent-grain recipe: dense rolls; not interested in repeating. My most recent loaf was the best to date. 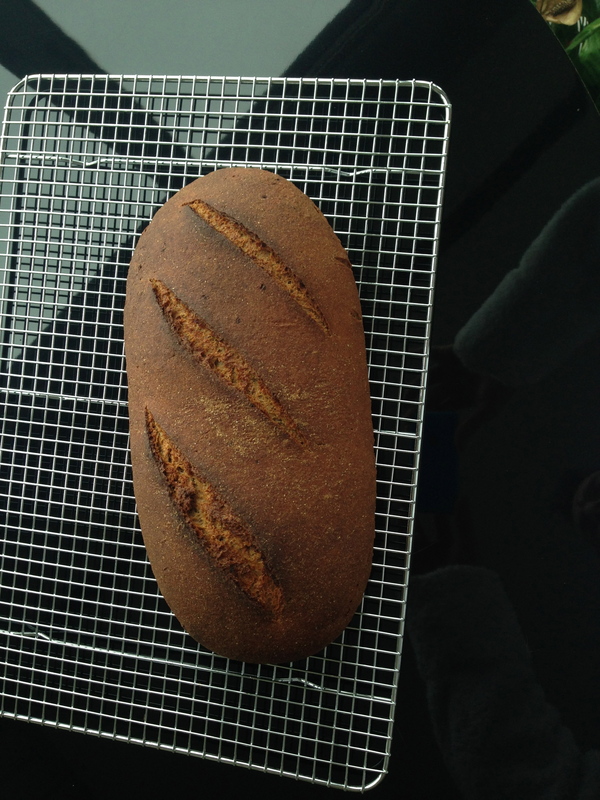 Meteil (less than 50%) rye baked as a “hearth” (not in a pan) loaf with caraway and onion flake. The key? Spraying the crust with water at 2 minute intervals for the first 6 minutes (aka: 4 total sprayings,1 as it first goes in) to produce significant crunch. Also, I stopped punching down to achieve a second rise before panning. I seem to have been exhausting the levin and thus creating dense final loaves with little to no oven spring. Additional final adjustment was realizing that I was working so hard to make the dough not be “messy” that I was working in too much flour which (a) taxed the levin too much and (b) reduced available moisture to out-gas steam during baking.